Do furniture makeovers inspire you? What gets you hyped up to DIY? Let us know in the comments! Let's start this list of furniture makeovers strong with a millennial pink makeover from My Melodrama. This look was achieved by dyeing a slipcover. This couch will have you thinking that the grass is greener, but you can get this look too. Kara Paslay Design shows us how to dye a couch's existing fabric without needing to remove it. If you've never reupholstered a piece of furniture before, this show-stopper from Retro Den will have you wanting to. If recovering an entire couch is just too large of a commitment, Jupe du Jour shows us how to quickly update drab cushions by adding some buttons. Concrete and paint brought these mismatched pieces together in thhis DIY by The Crazy Craft Lady. Design, Dining and Diapers demonstrates how to create the classic farmhouse table look to give your dining area a stylized appearance. These contrasting tones from Addicted 2 Decorating make me want to find a thrifted table ASAP! Happiness is Creating shows how bright color mixed with traditional finishes can take a dining set from boring to bold. 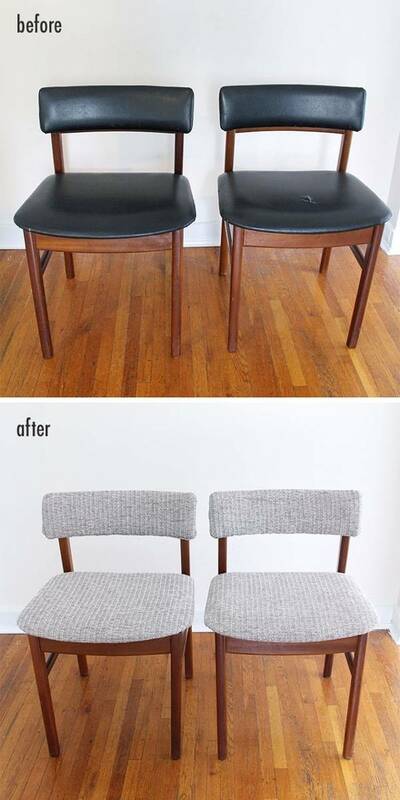 This before-and-after one of the most mind-blowing on this furniture makeovers list. Find It, Fix It or Build It has turned a very generic folding table into a wood-topped dining space. Centsational Girl reminds us that sometimes all you need is a new coat of paint. What a happy color! This mint-makeover was found on Love Grows Wild. A $10 desk gets a spray paint makeover over at Naptime Decorator. This desk (found literally on the side of the road) is totally facelifted on Our Nest in the City. That Winsome Girl polished the brass fixtures on this desk to get them to shine. The contrast of painted and stained wood is a classic way to redo a thrift-store-find (via Picked and Painted). A Girl & a Glue Gun courageously uses yellow spray paint to make this desk redo a reality. Sometimes an old table just needs a theme. In this case, Pillar Box Blue went with pineapples! A little paint can take a piece of furniture from one decade to another - like these mid-mod nightstands from The Weathered Door. The Clever Bunny is clever indeed, turning a clothing hamper into a table! We turned this nightstand into a tech-friendly bedside charging station. See this makeover here. Everyday Originals implements the classic white-and-gold combination with this makeover. A good choice of hardware (plus some paint) makes this nightstand from Visual Heart unrecognizable. Sometimes a piece just needs a little TLC, as seen in this nightstand makeover from Number Fifty-Three. A pop of paint brings this sad table to life (via Curbly)! From Curbly, pink gets patterned to add some flair to this teeny table. The Painted Hive totally turns a blah side table into one with specimen drawers. Talk about transformation; here at Curbly we turned a literal stump into a side table with wheels! Office furniture is usually boring, but Love Grows Wild knew how to fix that problem. The before looks like it could be found in any office anywhere. The after is just adorable. How cute is this cross-stitch work from My Poppet Makes? Dream Green DIY saw potential in this seater and gave it a blushing facelift with spray paint. A good pattern is key when picking upholstery fabric, as shown in these furniture makeovers from Hearts and Sharts. Gold paint is at it again! This chair from Dream a Little Bigger gets a vinyl facelift too! No seat? No problem. Sincerely, Kinsey shows us how to add a new one by weaving. 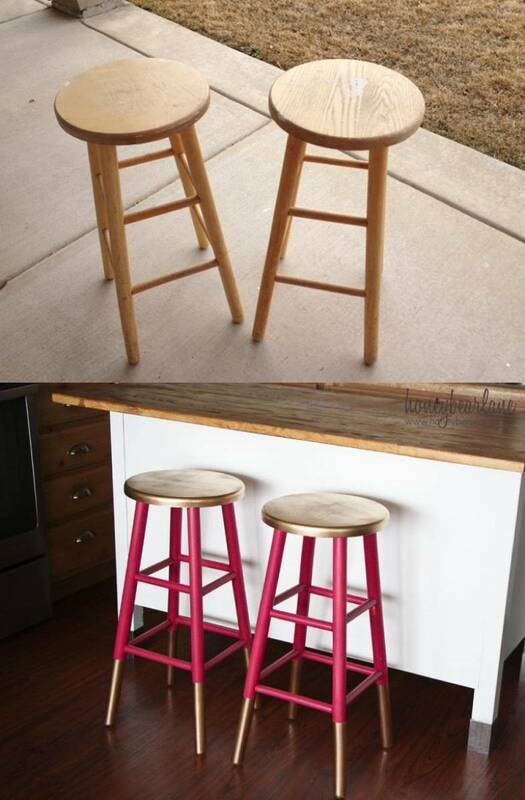 Cuckoo 4 Design takes some bland bar stools up a notch with spray paint and tape. This "before" chair (via Apartment Therapy) had seen its fair share of kitty-cat scratching. The "after" is a totally new seat! Design Sponge takes a boring wooden dining chair and turns it trendy with this ombré painting effect. We at Curbly took a bland all-white chair and added a hand-painted pattern. HouseNerd takes solid wood and makes it two-toned. This Curbly makeover involved entirely stripping an old coat of paint in order to start anew. Little Green Notebook makes their own pattern with a marker! Genius. Did you know you can paint vinyl? We Can Make Anything has the scoop. Honeybear Lane doesn't hold back with jewel tones and glam gold. Kara Paslay Design is at it again with a two-toned dye job. All Things Thrifty gets creative and uses decoupage to change the face of this seat. Out with the old and in with the new on this re-upholstery job from We Can Make Anything. 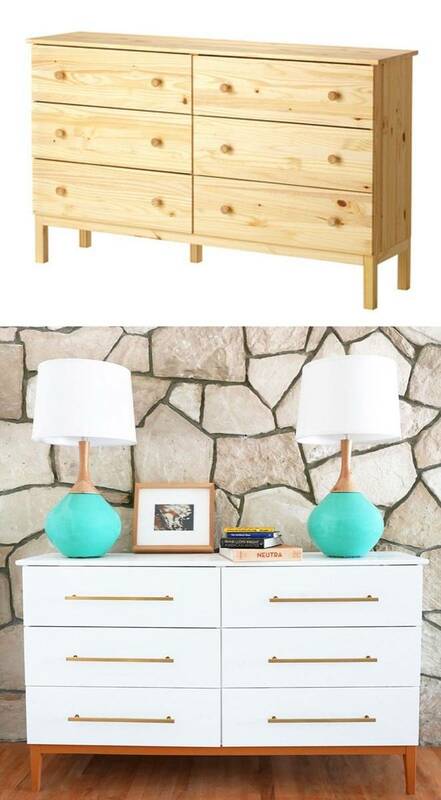 Design Sponge adds slats and leather pulls to bring this dresser into the present. This is one of my favorite makeovers in the list - A Cup of Life balances wood stain and paint, making this unique masterpiece. Tatertots and Jello gave this dresser a literal facelift. Sometimes what is most inspiring is seeing how a little elbow grease and care can refresh an old piece of furniture (as seen on Vintage Revivals). Uniquely Chic Furniture uses lace as a stencil to give this piece a shabby chic look. This dresser (found here on Curbly) gets gold-leafed. My Sister's Suitcase adds metal faceplates to this dresser. If you conveniently (and legally) find yourself in the possession of lots of road signs, you can do what they did over at Instructables. Want some extra details? Grosgrain Fab implements overlays in this redo. Coral strikes again! Sometimes the best option is to go bold, as seen on the Sarah M. Dorsey Designs blog. This yellow makeover from Zilverblauw is perfect for a kids room. So Resourceful paints all the colors of the pastel rainbow to create a bright piece perfect for kids' clothing. New hardware and a thoughtful paint job make this after photo unrecognizable from the before (via Camille Styles). A Vintage Splendor thinks outside the box by changing not only the hardware, but also the legs of this IKEA dresser. Frills and Drills goes from wood to white. A bit of contrasting colors in this classic mid-modern dresser via Design Sponge has me wanting to go thrifting. More inspiration from The Weathered Door! Saw Nail & Paint mixes not only types of finishes but also drawer pulls. We close out our list of furniture makeovers with one from This Old House. Olive green and wood tone compliment each other with shiny new knobs. Share this round-up on Pinterest! Still looking for more inspiration? You'll definitely want to check out our 100 favorite IKEA hacks of all time. I can't believe how awesome these are! The sofas are especially amazing! I'm totally doing this!